Because the Apple iPad is a portable media device, it has the tremendous ability to provide entertainment with everywhere you travel. All of this travel increases the chances for your device to succumb to damages. The Apple iPad can be easily dropped, sat on, crushed, or knocked off a car or shelf with little to no effort. Should any of these happen to your iPad, the entertainment doesn't have to end. Allow us to replace the damaged glass or LCD on your iPad quickly, with our expert iPad Repair services! Even if you don't live in the Akron, Canton, Kent, or even Columbus or Cleveland areas, you can mail your unit to us for any of our iPad repair services. There are a couple sub-versions of the Apple iPad Gen 2. When searching for differences we have seen these listed generically as the pre 2012 version & the 2012 version. Here is a quick breakdown of the two different types of iPad Gen 2 units. Second generation of Wi-Fi iPad, released on March 11, 2011. Model number A1395. Updated version of the original iPad 2, released in March of 2012 with a smaller die processor and updated internal construction. These are the units that change daughter board, PVM flex, headphone etc. The iPad mini introduces a unique issue to iPad repair. The iPad Mini Digitizer IC Connector is connected to the cable, & requires soldering to remove & soldering to replace onto the new Digitizer. The same IC must be used from the existing, original, broken glass Digitizer. Good news is that we have experience fixing these as well. It is incredibly often that the back case is bent with a cracked screen. We mod the case, punch out the dent, & smooth out the damage to your iPad. This is included with every glass & screen repair. Feel free to give us a call with any questions for iPad Repair, or any other services that we offer. Primarily a consumer device, the iPad has also been taken up by business users. 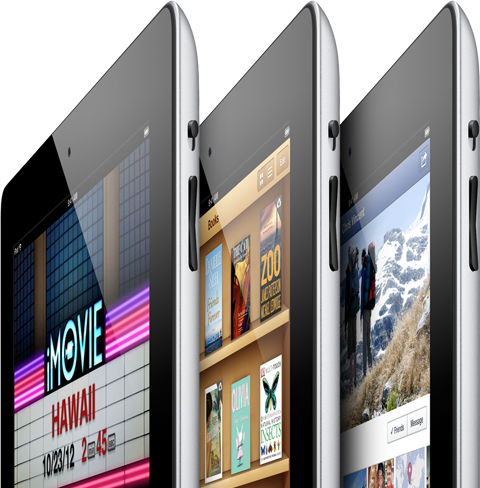 It is reported that within 90 days of its inital release, the iPad managed to penetrate 50% of Fortune 100 companies. Companies are adopting iPads in their business offices by distributing or making available the iPads to employees. Examples of uses in the workplace include attorneys responding to clients, medical professionals accessing health records during patient exams, & managers approving employee requests. A survey by Frost & Sullivan shows that iPad usage in office workplaces is linked to the goals of increased employee productivity, reduced paperwork, & increased revenue. The research firm estimates that "The mobile-office application market in North America may reach $6.85 billion in 2015, up from an estimated $1.76 billion in 2010. In 2015 it has been estimated that “82% of all web traffic generated by tablet devices is from an Apple iPad. Though some may that believe social networking to be counterproductive and a distraction, research shows the matter is that it is a dominant form of of communication with students today. Educators today simply need to be creative when using social as a learning tool. Sharing ideas and team building around topics of interest can be a powerful way to interact with students. It is also very important to develop and help students understand how to be responsible with social. The iPad has several uses in the classroom, & has been praised as a valuable tool for homeschooling. Soon after the iPad was released, it was reported that 81% of the top book apps were for children. The iPad has also been called a revolutionary tool to help children with autism learn how to communicate & socialize more easily. The iPad is the most powerful innovation technology in education today. It puts learning in the hands of the students. It just makes sense. Many high schools, colleges & universities have also used the iPad. Youngstown State University in Youngstown, Ohio, began offering three-hour rentals for the iPad for its Fall 2010 semester, in addition to rentals for the Amazon Kindle, laptop computers, & Flip cameras. The iPad is transforming the way we teach and learn. Powerful creative tools, interactive textbooks, and a universe of apps and content make for endless learning possibilities. All on a device everyone already loves to use. With over 65,000 education apps designed especially for the iPad and growing, just about every subject, learning style and grade level is covered. Some of the largest publishersof textbooks used in schools are all partnering with Apple to sell digital versions. Over 8 million iPads have been sold to educators worldwide in 2012 alone! If your have iPads in your classroom or place of business, we want to be your reliable source for iPad Repairs. We currently offer discounts for iPad Repair on Purchase Orders. Feel free to call or email us for more information. With more online streaming sites changing their video fromat from Flash to H.264 & HTML5, the iPad is seeing an increase in social television use. Viewers can use the iPad as a convenient 2nd networked computer, leaving their pc for maximum work load. In the healthcare field, iPads & iPhones have been used to help hospitals manage their supply chain. For example, Novation, a healthcare contracting services company, developed VHA PriceLynx (based on the Mobile application platform of business intelligence software vendor MicroStrategy), a business intelligence app to help health care organizations manage its purchasing procedures more efficiently & save money for hospitals. Guillermo Ramas of Novation states, "Doctors won't walk around a hospital with a laptop. With an iPad it's perfect to walk around the hospital with as long as they have the information they need." During the 2010 Major League Baseball free agent season, the agent for the player Carl Crawford was sending iPads to prospective teams interested in Mr. Crawford. These iPads were pre-loaded with video clips highlighting his player, & how it would benefit their team to have him. Fans attending Super Bowl XLV, the first Super Bowl since the iPad was released, could use an official NFL app to navigate Cowboys Stadium. In 2011, the Tampa Bay Buccaneers became the first NFL club to discontinue the use of paper copies of playbooks, & instead distributed all players their playbook & videos in electronic format via an iPad 2. New technology proposes the viewer the ability to choose alternative angles while watching sporting events. In addition to iTunes, the iPad is able to support many music creation applications. These include sound samplers, guitar & voice effects processors, sequencers for synthesized sounds & sampled loops, virtual synthesizers & drum machines, theremin-style & other touch responsive instruments, drum pads & many more. Gorillaz's 2010 album, The Fall, was created almost exclusively using the iPad by Damon Albarn while on tour with the band. The young conductor Alexander Geralis became popular by being the first conductor in the Balkan region to conduct an orchestra with the use of Apple's iPad. Apple's table computer has made it easier to take work, games and movies with you wherever you go. Even without a cd-rom or dvd drive, the iCloud allows you to remotely access any data remotely. For the millions of people who travel for work and fun each year, the iPad can lighten luggage and provide access to entertainment and information on the road. Since March 2011, the US Federal Aviation Administration has approved the iPad for in-cockpit use to cut down on the paper consumption in several airlines. In 2011, Alaska Airlines became the first airline to replace pilots' paper manuals with iPads, weighing 0.68 kg compared to 11 kg for the printed flight manuals. It hopes to have fewer back & muscle injuries. More than a dozen airlines have followed suit, including United, which has distributed 11,000 iPads to cockpits. Also, many airlines now offer their inflight magazine as a downloadable application for the iPad.